Get ready for Valentine's Day with 25 free spins on the delicious Sweet 16 slot at Grande Vegas Casino! Redeem the coupon code TH-121-SPINS to claim your free spins for the Sweet 16 slot if your last transaction is a completed a deposit in the past 15 days, but do not claim two freebies in a row. You can also find special new slot free spin coupons listed below or in the Grande Vegas Casino message center. Good luck! 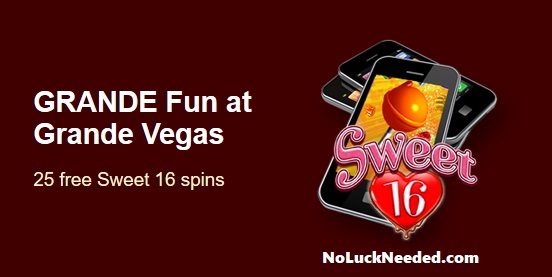 Claim your Sweet 16 25 Free Spins at Grande Vegas Casino!